Enterprise customers tell us that they’re looking for application modernization and greater agility. They may also need to work in a hybrid context, and want technology that makes it easy to run in multiple environments now, and in the future. To meet these needs, they are choosing application platforms such as Pivotal Cloud Foundry (and the upstream open source Cloud Foundry). Yes, there are many do-it-yourself solutions in the market, but these require investments of resources and effort to integrate, and in some cases custom security and compliance components must be developed as well. With Pivotal Cloud Foundry, you can instead focus on building your business-critical apps, on a platform that also provides “guard rails” and a rich feature set. There are two open source projects that you can use to get a Pivotal Cloud Foundry production solution up and running on AWS. Once there, you can accelerate the integration and adoption of native AWS services such as Amazon Relational Database Service (Amazon RDS), Amazon DynamoDB, Amazon Simple Queue Service (SQS) and Amazon Simple Storage Service (Amazon S3) into your applications stacks, as part of your modernization process. In this post, I’ll first show you how to rapidly provision Pivotal Cloud Foundry on AWS through an AWS Quick Start. Then I’ll demonstrate using the AWS Service Broker – now available on Cloud Foundry – to gain further agility and modernize your application stacks. The Pivotal Cloud Foundry (PCF) on AWS Cloud Quick Start is a open source CloudFormation-based reference deployment which can be provisioned in a few hours by filling in a few parameters. This solution will build out a production-ready, scalable, resilient, reference architecture (diagram below) which takes advantage of multiple availability zones (AZs), with a managed Amazon Relational Database Service (Amazon RDS) deployed in a multi-AZ configuration. Elastic Load Balancers allow for the addition of nodes without significant downtime. The deployment guide will walk you through the process of creating the required Pivotal network account and Route 53 Hosted DNS Zones. AWS Certificate Manager (ACM) makes requesting the required certificates very simple. Once these three steps are complete, you will be ready to launch the CloudFormation stack which builds out Pivotal Cloud Foundry in your AWS account. After Pivotal Cloud Foundry (PCF) is running in your AWS account, you’ll be ready to integrate the AWS Service Broker for PCF. With the Service Broker deployed, development teams can provision and expose native AWS services to their application workloads running in Cloud Foundry directly via the application platform. 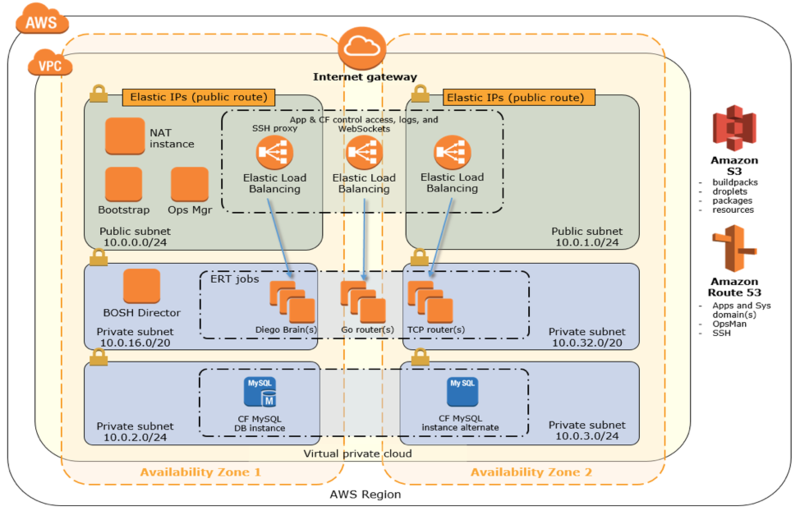 This could be PCF running applications on AWS via the Service Broker (catering for faster modernization and cloud services adoption), or applications running on PCF on-premises and consuming AWS services running in the cloud. The Service Broker provides multi-account provisioning, allowing development teams to take advantage of account-level segregation for project and cost management. A common and recommended practice is to use separate accounts for development and production workloads. The Broker can be configured to provision to either, depending on use case. Through the Broker, service plans build in best practices for high availability, encryption, and data retention. Customers can use configurable overrides to cater for specific use cases, and can customize the CloudFormation template in a private catalog to meet their specific business requirements. 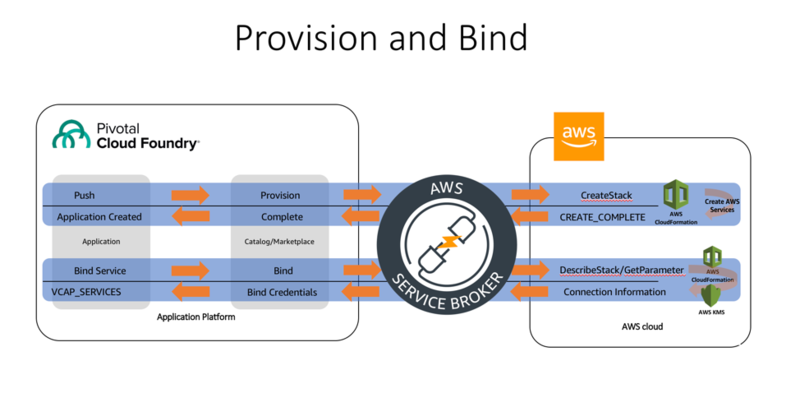 The Service Broker provides a powerful, elegant way to interact with add-on services: with just a few commands, developers can bind their apps to over a dozen AWS services. This kind of convenience helps customers go faster and improve business outcomes with differentiated software. First, follow the Pivotal Cloud Foundry Quick Start Reference Deployment guide to deploy the Pivotal Quick Start and Service Broker into the Oregon us-west-2 region. The Broker can be configured to use AWS Identity and Access Management (IAM) keys; however, we recommend making use of IAM roles, which can be attached to the cluster using an instance profile at launch. The following is an example IAM policy to allow the Broker to interact with CloudFormation, DynamoDB, and other services. This policy should be attached to either an IAM user or role. If using a role, the role will need to be associated with the nodes with an instance profile. The Service Broker use a CloudFormation service role, which will supply the required permission to the Broker to provision and manage the AWS services provided through the service plans. Caveat: At the time of writing, the Broker uses a CloudFormation Service role. After an update expected later this year, it will instead use the IAM User or Role shown above. Check the Service Broker documentation for the current status. In either case, the Service Broker has the permission needed to provision and control resources instead of providing access to specific teams. You can control which teams are able to interact with which Service Broker service plans via the Cloud Foundry role-based access controls. Click on Import Product on the top left. Browse to the downloaded Service Broker tile. The new tile install will appear on the left. Click the + symbol to install the tile. Once the Service Broker is installed, there are a few configuration steps which need to be completed. Click on the Service Broker tile, and select Settings. If you are using an ec2 instance role attached to the Broker hosts, specify “use‑role” as the value for both the AWS Access Key ID and AWS Secret Access. Otherwise, specify the credentials for the user. In this example, we’ll create an IAM user and attach the policy described above, then provide the Key ID and access key for that user in this configuration step. AWS Region: this is the default region for the broker to deploy services into, and must match the region that the DynamoDB table created above (this will be decoupled in an upcoming update). AWS CloudFormation Role ARN: specify the ARN for the CloudFormation Role. Now Apply Changes. Once complete, the tile will change to green. At this point, we have deployed Pivotal Cloud Foundry into an AWS account, and installed and configured the Service Broker. Now let’s deploy a simple example application integrated with the Broker. This application will consume Amazon Polly, provisioned through the AWS Service Broker. Click on the link to your credential. This will load a JSON payload with the password in it. For this example, I have an existing Org called Blog and space called Polly. First we will deploy one of the Service Broker plans, the Polly service. Connecting to the URL of the pushed application will fail – the application is told to connect to Amazon Polly, but at this stage there is no binding between the Amazon Polly service we have created and the application. Copy the URL shown next to Routes into a browser. 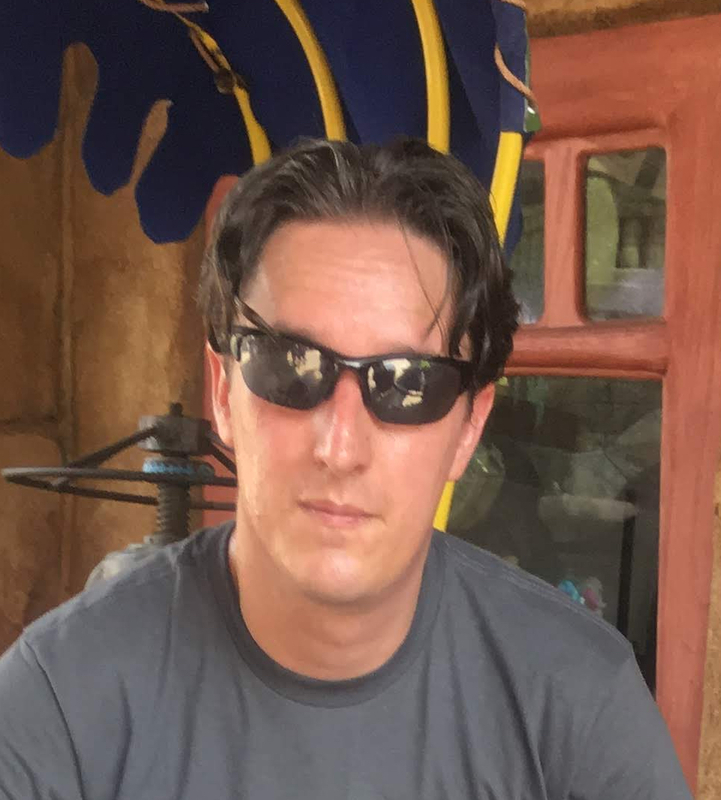 It is important to note that at no point did the developer have to wait for a cloud or ops team to deploy the AWS service and provide connection details such as endpoint or credentials, at no point was the developer required to leave the developer interface and switch context to an AWS web console, and no in-depth understanding of the service was required. Using the AWS Pivotal Cloud Foundry Quick Start and the AWS Service Broker, you can accelerate your deployment of Cloud Foundry into your AWS accounts, and build scalable, agile, elastic applications consuming native cloud services – more quickly, with less effort. Don’t just modernize, enjoy the ride with the AWS Service Broker! AWS is a sponsor at the Pivotal SpringOne conference taking place in Washington DC, 24-27 September 2018. Join us for the workshop, “Hybrid Made Easy: Modernizing and Moving to the Cloud with Pivotal Cloud Foundry and AWS,” on Monday, 24th September, 09:00am to 11:00am, where we will explore Pivotal Cloud Foundry and Pivotal Spring boot on AWS. For other sessions, refer to the event agenda. We look forward to seeing you at the event, and encourage you to contribute to the AWS Service Broker and Quick Start projects.